The University of Wisconsin Oshkosh Alumni Association invites you to join your fellow alumni for a celebration in honor of members of the Class of 1969 as they mark their 50th anniversary and all Golden Titans who have already reached this milestone. 2:30 p.m. Registration and Opening Reception Alumni Welcome and Conference Center (AWCC), 625 Pearl Ave.
3 p.m. Greetings from Chancellor Andrew Leavitt/Alumni College AWCC Explore campus resources, including UWO’s outstanding Learning in Retirement program, and enjoy a historical photo tour of campus by University Archivist Joshua Ranger. 10 a.m. Bus Tour of Campus (limited seating) departing from the AWCC. 1 p.m. Class Photo and Academic Regalia Robing Class of 1969 members lead the 2019 Commencement processional (2 p.m. at Kolf Sports Center) and will robe at the AWCC. Special seating at Kolf will be provided for spouses/guests. 1:15 p.m. Transportation to Commencement The bus will leave AWCC for Kolf. Following the processional and opening speakers, transportation will be provided back to the AWCC (at approximately 3:30 p.m.). You can register online for the 2019 Golden Titan Reunion. Below are the costs for the various activities. Rooms are blocked for May 17–18. Mention the UW Oshkosh Golden Titan Reunion to receive the following discounted rates by April 17, 2019. Parking available in the AWCC lot, corner of Wisconsin and Pearl on a first-come, first-served basis. Bus transportation back to lot will be provided after the commencement processional. Please avoid specially marked spaces unless you have the proper permit. For more information, visit uwosh.edu/parking. Call the Alumni Relations Office at (920) 424-3449, toll-free (877) 896-2586 or email alumni@uwosh.edu. Have photos or memorabilia to share? UW Oshkosh is seeking photos and other items from 1960s’ student life. If you have items to share, please contact University Archivist Joshua Ranger, (920) 424-0828 or email ranger@uwosh.edu. Each spring since 2009, the UW Oshkosh Alumni Association has welcomed back members of the 50th reunion class as Golden Titans. Members of the class, along with fellow alumni who have reached the Golden Titan milestone, are honored as guests at a luncheon. 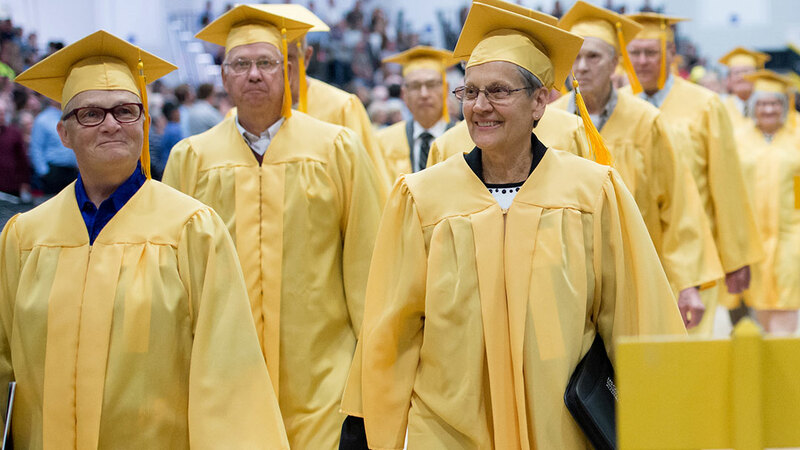 Members of the 50th reunion class also have the opportunity to don golden caps and gowns and lead the newest UW Oshkosh graduates into their future, during the afternoon commencement ceremony. Golden Titan festivities include a bus tour of campus, a class photo and a class dinner, usually held at a local restaurant. To make a donation to the Golden Titan Endowed Scholarship Fund which supports first-generation college students with financial need in honor of your 50th anniversary, please send a check payable to UW Oshkosh to UWO Alumni Relations, 800 Algoma Blvd, Oshkosh, WI 54901. Please write Golden Titan Scholarship in the memo.